The block chosen for Zelda Keebaugh's quilt is of the "Ins and Outs" pattern. 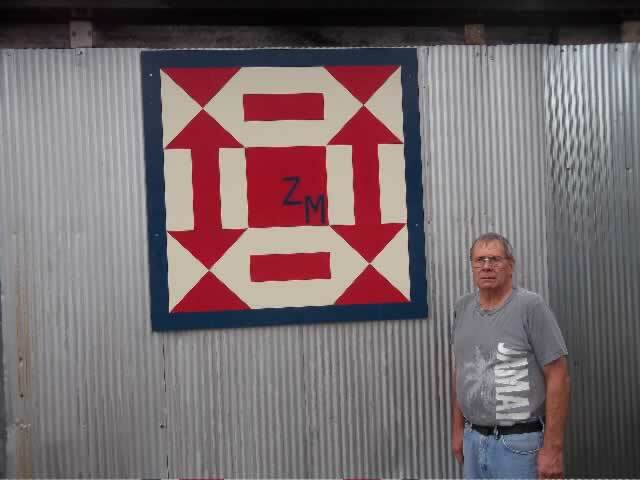 When her son, Harper, and wife Sheila moved back to Pennsylvania from West Virginia, this quilt was fount deep within a storage box in the homeplace. It was in this home that Harper and his older brother, Edgar, were born. The house dates back to 1796 and stayed within the Mellott family, of whom Zelda was a descendant, until L.D. Keebaugh bought it in 1921. Having lived through the Depression and WWII, Zelda was very frugal and used what was at hand for her sewing needs. Her quilt is made from feed sacks and is showing signs of wear. It was made prior to her marriage to Sam Keebaugh in 1942. Like many folks of that era, they did their part in the war effort. Sam, being the last surviving son, was not eligible for war service, so the two of them packed up and went to work at Fairchild in Middletown, Md. After the war they returned to their farm. and stayed in the home place except for the last three months, when cancer took her life in 1995.